I recently spent some time in Maine celebrating the 35th anniversary of my family’s bakery and restaurant. Such a great time and what an amazing turnout- over 250 people came to celebrate with us! It was an honor to listen to everyone tell stories from over the years. It brought such joy to have my family together. 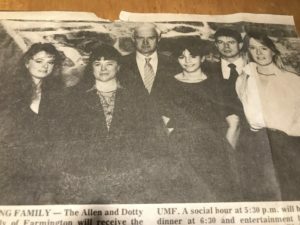 The picture below is from 1988 with my parents, sister, brother and his wife, celebrating an earlier milestone in the family business…and yes, that’s me on the left with the big 80’s hair! On the drive back to Vermont from Maine, the event got me thinking about the importance of fluidity in business as a base for longevity, success, and fulfillment. Being rigid and doing things because it’s how things ‘should be done’, or ‘it’s the way things have always been done’, doesn’t support our growth, work-life alignment, evolution, or (most importantly) joy in business…or our personal life. If we’re continually working against our natural flow, attempting to swim upstream so that we can achieve success and experience fulfillment, it’s simply not sustainable. We eventually call uncle and wonder why it didn’t work out. If who we are isn’t in alignment with what we do, we will continually struggle. This made me think of a client I’ve been working with recently. He runs two businesses, is incredibly talented and extremely passionate about his work. He was getting caught up in the ‘shoulding’ of business. He should be more organized (in the traditional sense). He should manage his time better. He should know what to do when to do it, and how to do it…without fail. He should be more technical. You get the picture. But here’s the thing, he was working hard to build his business from a set of ‘rules’ that didn’t align with who he is. He was struggling, not allowing his beautiful, creative mind to flow, to ALLOW. We talked about the metaphor of a river bank and using the edges of the river to guide him, but not confine him. Creating an ebb and flow to his day, week, month, year that feels inviting. Going with HIS NATURAL FLOW, instead of against it. Life would be rather ‘beige’ and unexciting if we all approached our days in the same way, yes? It’s the contrast, the learning…the unfolding that invites us to truly experience and expand. As my client settles into doing things his way, owning his style of doing business, he’s finding the river banks an inviting place to slow down, relax, and relish, not something to avoid. How do you stay in alignment with who you are as a business owner? Where do you get tripped up in the ‘shoulding’ of business? What beliefs would benefit you to let go of so that you can embrace ones that serve you and your goals at a higher level? And, who do you need to be to make that happen? I’d love to hear from you if you’re willing to share!